I’ve been in serious garter stitch baby-knitting mode around here. 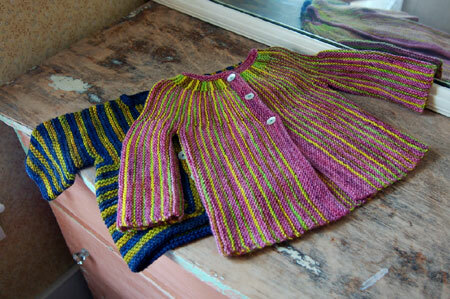 There’s been another rash of pregnancies, which I’ve managed to elude (whew), and these babies need sweaters! I’d been meaning to make this DROPS pattern for ages, and now that I have, I think it’s like a feminine, or maybe just sophisticated, BSJ. I can see myself making many more, and with 2 more friends pregnant, I’ll probably be doing it soon! The pattern is a fun knit. The short rows are dead simple to memorize and even the measurements are, as well. The front is the same width as the sleeve and the back is twice as wide, and so on. I had major trouble getting gauge. The pattern calls for sport weight and while I’d have loved to use Fat Sock, I ended up using the regular Sock and still didn’t get get gauge. I ended up with 26 sts. per 4″ instead of 24 and the sweater is very big- probably fitting a 12 month old+. This leads me to believe the pattern is a little on the big side, even without a gauge problem. It certainly is a squishy lovely thing, and well-suited to a solid (or semi-solid, as in mine) and hand-painted yarn combo. Ack! There has been some confusion and/or excitment about the fiber club that just shipped. That was January’s fiber and new members to the fiber club are members for February-April. February’s fiber will ship later this month. I’m sorry some people were stalking their mail carriers and not getting satisfaction from it. The drops sweater is just gorgeous – one more for the queue! beautiful sweaters! that drops sweater is awesome. That drops sweater is gorgeous! Thank you so much for posting the link! The bsj I’ve done and I love it. But that Drops cardigan is beautiful! I think I’ll try to make a boy version for my 4 mo old. I want a Drops cardigan for myself! That is gorgeous! For the Gallery, you have to add a little thing to the gallery reference that markes them all as a set that go together. Also make sure you have the files for the Next and Previous buttons in the right folder. It may mean you have to copy them a few times until you find the right spot. Oop, sorry, that is Lightbox and not gallery. Never mind!! Those sweaters are both so cute! I wish you were one of my friends and would have made one for my little girl. So so cute! Beautiful baby sweaters! Love the colours. Both sweaters are adorable. I hadn’t seen that DROPS one before so thanks for that! Your bold BSJ stripes are awesome. I bet the inside of that one looks pretty badass too. How gorgeous. Very beautiful. And, thanks for sharing. I love both of those sweaters, but especially the DROPS one…I am going to have to give that one a try. It looks like one of my beloved yoke-style sweaters, but the construction is so different! they are lovely. my little knitting muse has got wool allergy. argh. but i have a niece or nephew coming soon and maybe that one will not. I love your Drops-Jacket! It’s much more beautiful than the original and the colours are awesome. Oh those are so cute! I think it must be a Spring thing or something – there are literally SIX folks at my workplace who are pregnant right now.. that’s a lot of knitting! Oh, I absolutely love those sweaters! I’m not a fan of pastel, wimpy colours for babies and much prefer the gorgeous, rich colours you’ve chosen. Well done! I love your Drops Jacket. I made one last year for a friend’s daughter, and every where the little girl wears it, my friend gets stopped and people want to know where she got it. The DJ is a wonderful pattern and exactly like you say, just a little more sophisticated than the BSJ, which I adore making as well. Love the drops sweater – I hadn’t seen it before, but will definitely keep it in mind for future baby knits. Your sweaters are beautiful and inspiring. The Drops sweater reminds me of one I have on my to-do-list from an old Patons baby book. Oh! That little purple and green one plucked at my heart! SO cute! One of the reasons I am sorta glad I had boys is that I never had to knit totally cute sweaters for them!